How many calories a day does my dog need? Dogs really do have fast metabolisms. Pound for pound, a medium size dog needs about 1.5 times more calories than a medium size person (dogs are so lucky aren’t they!). 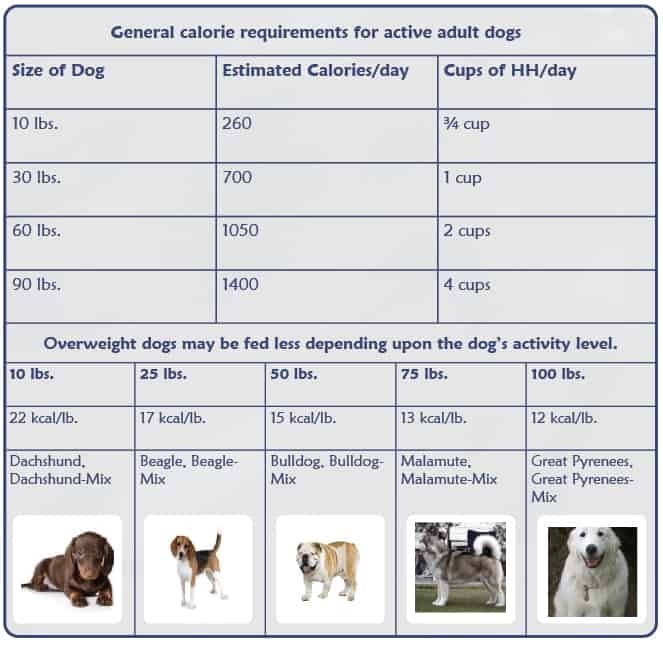 Younger or more active dogs need even more calories. That said, too many calories can cause excess weight and lead to many problems. The best solution is to feed proper amounts of nutrient rich, digestible diets with high quality, animal proteins and high quality fats. This will provide your dog with both essential nutrition and the majority of calories in his diet. Starches then provide the remaining calories as well as make the hard, crunchy texture dogs like. Digestibility of the proteins and fats is really important. It ensures good nutrition as well as that most of the calories don’t come from sugars. Animal muscle and organs are excellent sources of protein. Dogs can efficiently digest them to get a balanced blend of indispensable amino acids. Fish oil and chicken fat can provide a balanced blend of essential fatty acids. Recommended daily calorie intake is based on several factors. First is the resting energy requirement or basal energy metabolism to support body size. This is the amount of energy needed for basic body functions (digestion, respiration, etc.). Smaller dogs need more calories per pound but less total calories than larger dogs to support basic metabolism. Additional calories are needed for activity and/or growth. The amount of additional calories depends on age, activity level, pregnancy and neutering. For example, a young Jack Russell terrier needs more calories than a neutered, middle aged poodle. The amount of calories will change with age. Puppies obviously need extra calories per pound of body weight. Adult dogs generally need fewer calories per pound of body weight unless they are very active (working, training, or hunting). Senior dogs generally need fewer calories because they are less active. However, some senior dogs may need extra calories if their digestive system becomes less efficient. What are general recommendations for calorie intake? Recommendations for calorie intake are guidelines. The amount of food will change with age. It can be less during winter and summer but more during fall and spring. Ultimately you have to monitor weight of your dog and adjust as needed depending on his or her activity level, etc. You know best. For good body mass, the ribs should not be covered by excess fat and the abdomen should be tucked up. Images of good body mass are available at web sites of most veterinary colleges. Table 1 lists the recommended amounts of High Hopes® Full Feeding Diets for adult dogs. Treats are a part of your dog’s diet too Generally speaking, about 10% of your dog’s weekly calorie intake can come from treats.